It doesn’t take much more than a brush, bucket and ladder to get into the painting business. To get the quality paint job you’re paying for, ask these questions and make sure your contract is very specific. Of all the trades, painting offers the most opportunities for less than skilled workers to pass themselves off as experienced pros. It’s also easy for unscrupulous sorts to work a scam on homeowners. In one classic scheme, the painter charges you for premium paint but applies a lower grade. We recently had a situation where we caught a painter pouring cheap paint out of 5-gal. pails into empty cans of expensive paint; he was charging the customer for the higher grade and pocketing the difference. He was gone by noon. It’s important to hire a painter you trust. Much of the work takes place when you aren’t around, and it is difficult to check a painter’s work. Once the job is complete, you won’t be able to tell if he primed the entire surface or even if he applied two coats rather than one. Before you hire someone, check their certificate of insurance to guarantee he has general liability insurance. Also, verify that workers’ compensation insurance is in effect, if he has any other employees. Checking the quality of work isn’t as easy. Painters will offer photos of past jobs as testimony of their skill, but these won’t tell you much. For an exterior job, for example, they’re usually shot from the curb. This is too far away to show visible brush marks and wobbly cut lines on windows and trim. You have to go to a site and take a close look. When you ask for references, the painter will likely steer you to a current or very recent job. Most freshly painted houses look great. But because the real test of a paint job is how well it stands up over time, inspect a job that was done at least three years ago. Consistent wear over the entire surface. Cracked glazing compound around windows. Also check for signs of overspray, splatter or spilled paint, especially on the roof, driveway, sidewalk and shrubs. Ask the homeowners if they’ve noticed any problems with how the paint is weathering, if their landscaping suffered any ill effects while the painter was working, if the painter kept to the budget, and if they would hire the painter again. A contract with a painter is more than an agreement to paint your house for a specific price; it’s also your chance to commit the painter to following specific prep and application methods, use quality materials, protect the site, and clean up properly. It’s also the way to set a payment schedule. For outside work, proper prep is crucial to the durability of the paint job. Don’t settle for vague contract language like “properly prepare all surfaces.” If you have wood siding, the contract should state that the painter will power wash the house with a bleach or TSP mixture. Also demand that the power wash operator be experienced. In the wrong hands, these high-pressure water guns can blast through windows, scar siding and tear screens. As for the actual prep, require that siding be disk-sanded. The sanded areas should then be feathered with a palm sander to blend in with the rest of the job. Also specify that all gaps be filled with caulk and that all the siding be primed with a penetrating, slow-drying primer. Avoid “spot priming,” where just the bare wood is primed. For inside work, make sure the painter checks all drywall joints for smoothness and fixes damaged walls. For wood trim, stipulate that the painter fill nail holes, seal knots and prime with a slow-drying primer. A contract for premium work calls for all woodwork to be sanded between finish coats. The contract should specify how the paint will be applied. 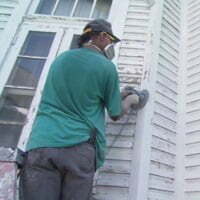 For exterior work, primer is best applied by brush. I don’t notice much difference between spraying and brushing for topcoats and for exterior work, though spraying uses more paint. What’s more, a painter experienced in spraying and ample overspray protection are a must. Also write in minimum drying times. Painters who want to speed through a job will spray over wet caulk, and even want to apply a second coat before the first has time to dry properly. Leave at least a day between each coat. Also make sure your painter isn’t putting latex-based paint over oil-based paint without the proper primer. Latex over oil without priming is a recipe for serious peeling. Write into the contract the paint you want by listing the manufacturer name along with the grade, color, gloss and base. Painters may recommend a paint, but it’s usually because they’re getting a good price on it, not because it’s a high-quality finish. So, do your own research. You’ll find, as I have, that you get what you pay for. The contract should require your painter to use drop cloths (or masking tape and paper) to cover everything at risk from spillage, splatter, or overspray. For exterior work, this means shrubs, the driveway and even sections of the roof. For an interior job it should include floors, cabinets, and electrical fixtures. If I walk onto a site and don’t see a sea of drop cloths, I grow suspicious that the painter isn’t thorough enough. Also require that the painter return the site to prejob conditions, especially landscaping. And agree before the job starts who will clean the windows–and if it’s part of the painter’s fee–once the work has been completed. Never give the painter more than 10 percent of the total job cost at the contract signing. Thereafter, disperse one-third of the remainder on the first day of work, a third at the midpoint (use a job milestone, like “all prep done, primer and first coat applied”) and the final third after the painter has cleaned the site and removed his gear and you have approved the job. Once you hand over that last check, it will be tough to get the painter to return for touch-ups. Before the painter starts working, take a walk around the house with them and make a note of all cracked glass panes, torn screens, and old paint spills. This kind of damage is common when painting; but if you know where the existing damage is, there won’t be any argument at the end of the job when you point out new problems. Too often I’ve seen homeowners who were unable to substantiate that a painter damaged something because the painter can always say it existed before he arrived. This is especially true of window panes, which can take a real beating during prep and reglazing. I like that you said that a contract can contain your payment schedule and the agreement that your house is going to be painted for a specific price. With that in mind, I’ll be sure to ask a painter to provide me with a detailed contract. We’re planning to have our house repainted to give it a newer look. Our son’s school fees are actually due this month, so we have to make sure that we’ll find a painter that won’t surprise us by unwanted fees. Thanks for explaining some tips for hiring a professional painter. It’s good to know that you should try to discuss what paint you want and have it listed in the contract. it sounds important to discuss it with the painter so you have a better idea of what paint will fit your needs. According to me i also think that it is very important to hire a professional for home painting. As they belong to this field particularly they can guide in a better way. Even after reading this post i came more closer to this fact that how much it is important to hire a professional home painter. Listen to your gut and vacuum thoroughly and wipe down your woodwork! You also might want to have some plastic or drop cloths handy in case he doesn’t have enough, and move everything out of the room you can, or move it to the center of the room. I work for a property mgmt co & have hired a seemingly reliable man who has worked for this co for several years. He is giving me a HUGE discount & I want to make sure I ‘prep’ my place b4 he starts in order to make the job as easy for him as possible. What should this entail? I’m thinking I should have the pplace as dust free as possible, (i.e. getting behind couches, dressers, under beds etc b4 he comes in). Is that something they do or should I? My gut says I should because he is really going to do it on the cheap. I know he’s good because my boss (owner) completely trusts him. Please advise. Thanks. Calculate how many hours it will take you to complete the painting project based on your past experience and multiply by the price per hour you feel your time is worth. A friend asked me to paint his bedroom. It is approximately 12×12. What should I charge him? I’m not a professional but I do very good work. I’ve been painting since I was a teenager. How can I verify that builder used primer and two coats of paint on interior walls?